Get ready for an Awesome Pawsome evening with your canine friends at Inorbit Mall, Malad. Inorbit is all set to host the third season of “Dogs Day Out” – an extravagant social evening for the pets and their pet parents. Block your date on 9th of December and spend an exciting evening with your pooches. The current season gets bigger and better with whole lot of engagement zones, competitions and loads of surprises for your pets. Style your pets for the fancy dress fashion show to win whole lot of surprises and witness the pet obedience demonstration by experts. Your pet can participate in a special pet parade. The event is a perfect way to show your compassion towards your pooch, by treating them to a Dog Spa by Just Dogs, Juhu or gifting them exclusive merchandise like clothes, jerseys, bows, leashes. You can also capture special moments with your pet at the special Photo booth or get a caricature done with you pooch. Inorbit has also associated with PALS NGO where you can give a new home to abandoned pets by adopting them. 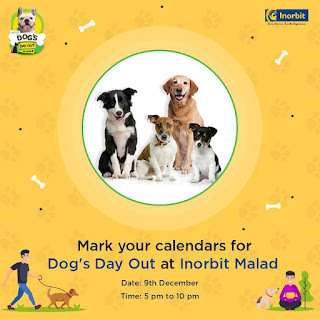 The Dogs Day out is one of the most popular annual events that has been conceptualized and hosted by Inorbit Mall and Living Dreamz Events. The event has garnered tremendous response from all age groups and the attendees of the event increase every years. The event is open for all and is not to be missed.